Despite my best laid plans to maintain my weekly posts while abroad, I’ve fallen a bit behind. I could blame it on the touch-and-go international Wi-Fi connectivity, but the truth is that I was distracted by laughter, sunshine, amazing cuisine, and making lifelong memories with incredible friends. Of course now I’m home and settled back in the San Francisco Bay… and while I’m sad that my travels have come to an end, I’m happy to be back in business! Before embarking on my travel adventures over a month ago now, I restricted my food consumption to that which was already in my refrigerator with the intention of keeping food waste to a minimum. It also gave me the opportunity to mix and match unique flavors and ingredients, which resulted in some surprisingly tasty recipes (along with a few that…. well, won’t be posted here). 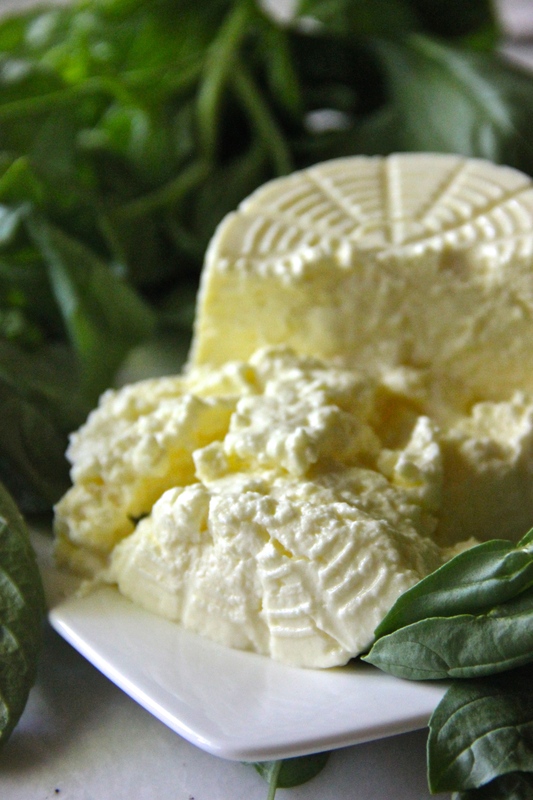 In perusing the contents of my fridge one day, I came across a container of ricotta cheese that I’d purchased on a whim a few days prior. That spontaneous purchase turned out to be a home run… it was one of the creamiest ricottas I’d ever tasted, and after thoughtful deliberation I paired it with slices of sourdough, honey and basil to create a sort of sweet crostini. 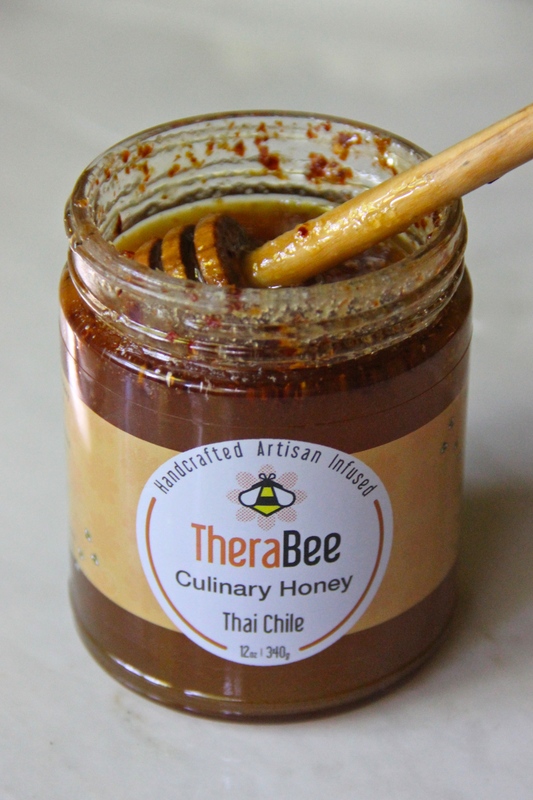 As remarkable as the cheese was, what really made this dish a winner is the chile infused honey by TheraBee. 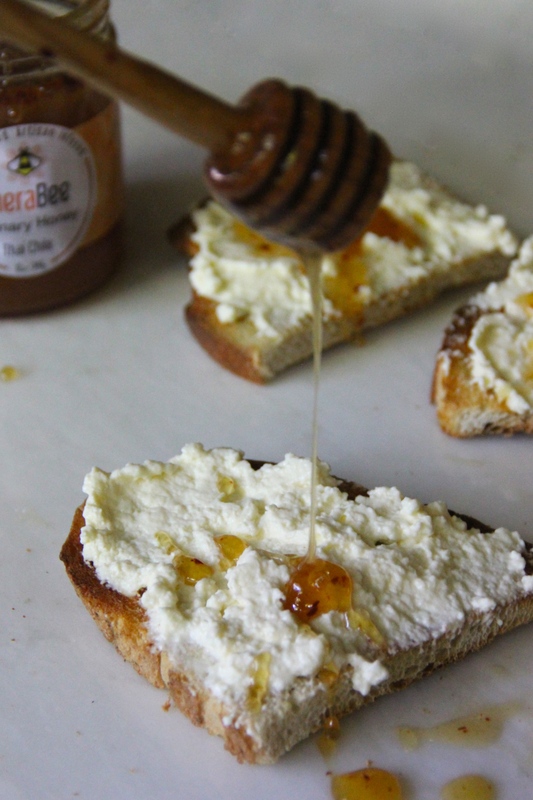 I discovered the company about a year ago at a winery boutique in the Central Valley, and after tasting several of their varieties (including Herbs de Provence, Sea Salt and Ginger & Hibiscus), TheraBee products quickly became a staple in my kitchen. (Side note: they also make the perfect holiday or hostess gift). 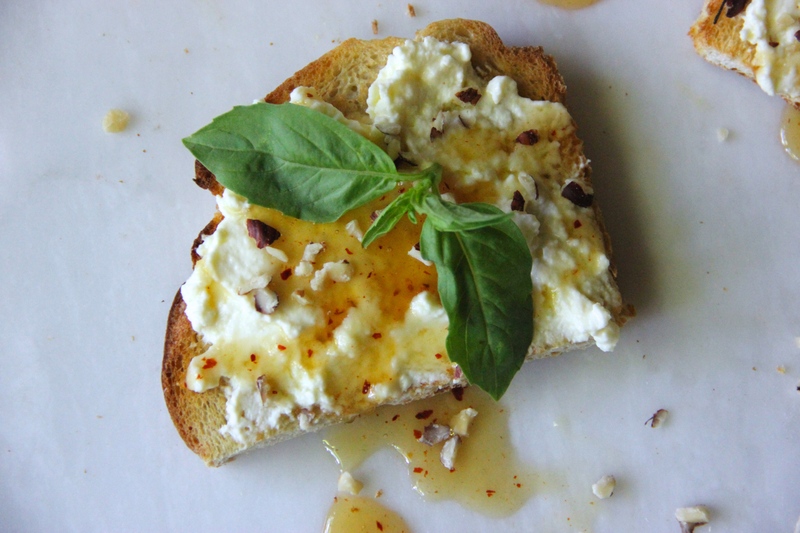 While you can use any type of honey in this dish and don’t have to use this particular variety, I found that the kick in the Thai Chile perfectly complemented the creamy ricotta and sweetness of the honey. The ingredients in this recipe are uber-simple, but the results are extraordinary. 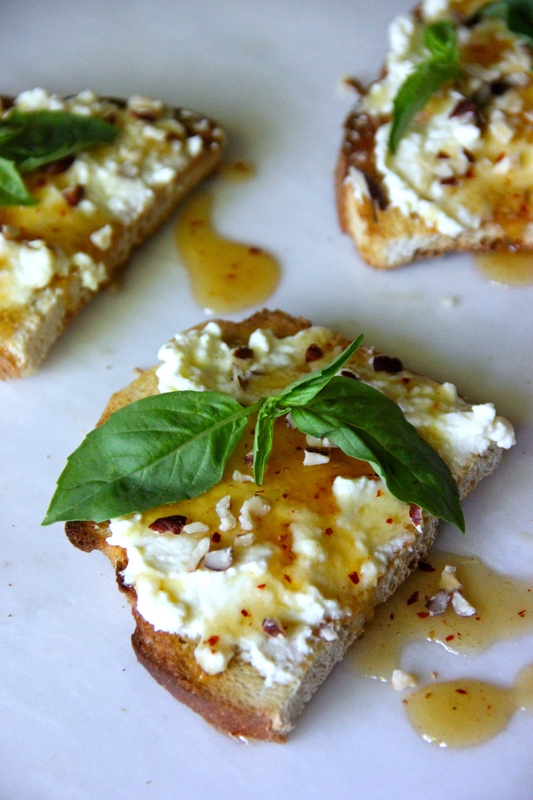 It makes for the perfect (albeit indulgent) breakfast, afternoon snack, or even dessert. **To toast hazelnuts, first chop them coarsely. Then put them in a skillet and stir over medium heat for about 2 minutes. Remove to cool.